Darin Mickey’s Death Takes A Holiday is a study of used record stores in New York, New Jersey, and Pennsylvania as sites where record collectors attempt to reconnect with an idea of the past, their own past, and the legacy of music. Mickey says it in one line in his press release: “Shot from the perspective of a middle-aged man restlessly clinging to his youth and the hope of finding that elusive artifact to make anxiety subside and keep the reaper at bay, Death Takes a Holiday shows us a community of beautiful recluses brought together by obsession, compulsion and a pure, undying love of music.” He shows us the absorption of men – his subjects are all men, though not all middle-aged - hunting through endless bins of albums, artists and genres on divider cards labeled with fat black marker. The men stand in rapt attention, transported, their focus fixed on the records before them. The book’s front endpaper is a detail from the cover of Bryan Ferry’s first solo album, 1973’s These Foolish Things. The choice of These Foolish Things to set the tone for Mickey’s book is a good one: while Ferry’s band Roxy Music was recognized for their pastiches of musical styles, colliding music’s past and its future, These Foolish Things was Ferry’s unapologetically affectionate tribute to pop songs that he loved, by Bob Dylan, The Rolling Stones, The Beatles and others, a nostalgic nod to the music with which he’d come of age. For all of its yearnings for the past, These Foolish Things now, itself, belongs to the past, one of so many albums that appear frequently and inexpensively in used record stores, its supply far, far exceeding any possible demand, a most minor album by a major player. Death Takes A Holiday complements Ferry’s love of yesterday’s songs and reflects similarly on the search for a connection with one’s own past through music. Mickey photographs in older used record stores -- not the newer shops that have opened with the resurgence of interest in vinyl -- that serve as both archive and den, crammed from floor to ceiling with the stuff of the past. All of these records, a store but also a repository, add up to a physically persistent accumulation of song and music, more than any one person could listen to. MIckey shows us the environment that allows record collectors to fall comfortably into their intense focus: the plywood and pegboard, the layers of memorabilia and obsolete technology, the thick layers of dust and fluorescent lighting. These places, where old things are respected and not thrown away, are sanctuaries in which the collectors can safely indulge in their pursuits. Mickey’s photographs demonstrate that each object in the store, whether a dusty sleeve, a rotary phone, a box of albums, is meaningful only in relation to the place. He draws attention to patterns: the different cardboard boxes that hold records, printed with their original contents (“eggs”, “poptarts”, “Kit Kat”); the endless stacks of boxes and shelves. Everything is torn, dinged, curled, or has a hole in it, but what’s important is that the vinyl itself is in good shape. At moments, it seems that he has recognized something almost spectral: the white back of a cardboard standup, carves an Elvis-shaped silhouette in space. The modest book (it’s the size of a 7” single) is nostalgic but not sentimental. Death Takes A Holiday speaks to time and mortality, but in a light, playful way. Mickey doesn’t pity his subjects for their pursuit of their youthful sense of possibility; he is one of them, as I am. The past is full of plenty of things that we don’t need, far more than the things that we do need. Sorting that all out, recovering something that was once important to you, and which will remind you of who you were, that’s part of the pleasure of the quest. But the love of music, Mickey suggests, may not be quite the same as the love of collecting. Where the former lets you lose yourself for the duration of a song, the latter is defined by the feeling of need that led up to it, the feeling that all of the music in the world has washed up somewhere, and that in these piles of records there is something that will reward your time and attention, and your will to not forget, because you can’t let go. All images © Darin Mickey, courtesy of J&L Books. Death Takes A Holiday ©J&L Books and Darin Mickey. Vsit his website or contact Leo here. 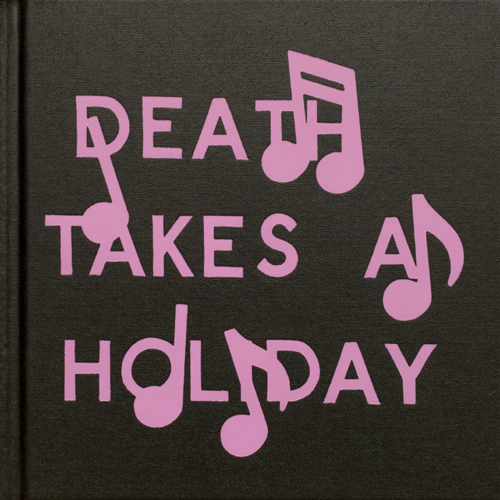 Support Fraction and purchase Death Takes A Holiday here.